Remember that time, back in your childhood maybe, when you found yourself alone at the table, minutes, maybe hours even after the mealtime had passed, staring a pile of green something-or-other in the face? Yeah, I think we all do. The phrase "You may NOT get down from the table until your plate is clean," uttered emphatically by our parents, echoes fresh in our minds like it was just yesterday. They meant well, really they did, but I think there are better ways to raise up healthy eaters than to engage in battle. Although I am a nutrition expert by title, let me assure you that I'm right there in the trenches with you, maneuvering the challenges of feeding my own kids. Feeding children is HARD and I've watched many-a-mealtime go downhill as it morphed into a battle of wills. My growing passion is to help change the way families approach the table by removing some of the power struggles that can easily develop around food and mealtimes. Since our kids will not reside under our roofs forever, my goal is to help others empower their kids to make their own good choices. Are you in? In our society, there is so much focus on WHAT to feed our kids and so little focus on HOW to feed them. I'll fess up. I like to go "under cover" when we go to my kids' well check ups. Who knows, maybe it's written in giant red letters on the outside of each of their charts "SHE'S A DIETITIAN" but really, I just want to know what doctors are telling parents without a nutrition background about feeding their kids. My children have an incredible pediatrician and you couldn't pay me money to switch to anyone else. They have received wonderful medical care throughout the courses of their lives. But, I must confess I've been a bit surprised by scarcity of how-to feeding guidance that has been provided to me. So if you're looking for a little more guidance on this big, rather important topic, I can point you to some resources that can help. Many of my favorites were created created by a fellow dietitian, Ellyn Satter, and I would highly recommend her books "Child of Mine: Feeding with Love and Good Sense" and "Secrets of Feeding a Healthy Family" if you are struggling in any way with feeding your kiddos. She also has a wonderful website with a lot more information if you are looking for additional resources. Before we begin the actual act of feeding our kids, we need to build a foundation and lay some ground rules. And I think the best way to start this is by introducing you to "The Division of Responsibility," also known as "The Golden Rule of Feeding," which was developed by Ellyn Satter. In it, Satter outlines our responsibilities in feeding as the parents, and our kids' responsibilities as the ones being fed. I believe having a clear framework that differentiates our jobs and from our kids' jobs is essential for maneuvering the endless eating and feeding obstacles our kids will throw our way. In the same way that establishing a family system of rules regarding how we treat and store our belongings helps keep us from living in constant chaos, operating under the Division of Responsibility in feedings helps us determine when to intervene in a feeding situation and when to let go. Okay, so what is this Division of Responsibility? Here goes! If I totally just blew your mind, go back and read it again. Did you let the words sink in? You as the parents get to decide WHAT foods to serve, WHEN to serve those foods and WHERE to serve them (at the table, on a bench at the park etc). Your child gets to decide HOW MUCH of those foods you served to eat and even WHETHER he or she wants to eat them at all. Have you heard of this approach before? Are you following it? Or does it sound totally foreign and maybe even foolish? (Why yes, I just said your kid gets to opt out of eating the food you worked so hard to prepare. How super annoying is that, right!?) But don't bail on me and call it all blasphemy. There is so much more I want to tell you. While you may not just yet be able to fathom how this methodology works in practice, I'm guessing it is news to no one that our relationship with food in the United States leaves something to be desired. Obesity is affecting kids at younger and younger ages, eating disorders are rampant and body image issues continue to wreak havoc on kids and adults alike. I imagine you can rattle off a whole list of personal food and body struggles as easily as you can your own phone number. Many of us have lost the ability to enjoy eating without guilt, we've lost our hunger and satiety cues after drowning them out for so long, and we don't know how to confidently nourish our bodies. Let's do our kids a favor and not pass on all our junk, shall we? 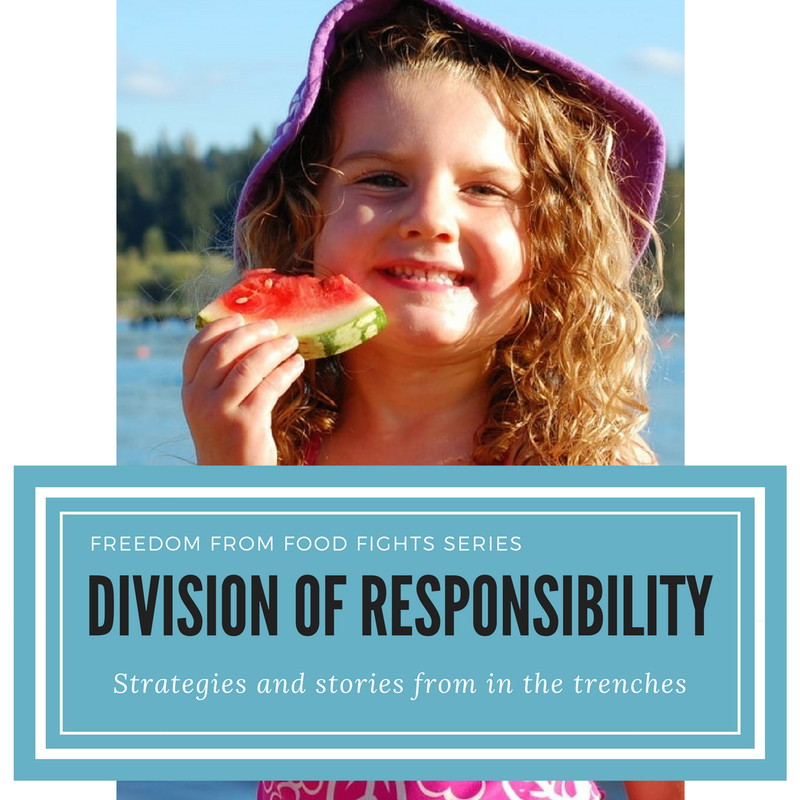 When I first learned about the Division of Responsibility, it went against nearly every grain in my body and I didn't think there was any way it could "work." If I didn't force my daughter to eat her broccoli, "How would she ever eat broccoli? ", I wondered. As a type-A, self-proclaimed control freak, the idea of letting my child decide whether to eat made me feel very uncomfortable. How would I make sure she was getting everything she needed? Well, the thing is, I totally DO still have a say in what my kids eat because I am the one who gets to decide what I offer. Since I am responsible for choosing which foods to prepare, it guarantees me a degree of control, at least when we are eating at home (when they are in others' homes, we are at the mercy of our hosts but I firmly believe that is healthy and ok). Though my kids can opt to refuse what I serve, if I only serve nutritious options and don't break the Division of Responsibility and allow them to short-order something else for dinner, then what they consume will be healthy. Are you following? The truth is, sometimes, OK, a lot of times, actually, my kids don't eat vegetables. But I don't sweat it (I will get to America's odd obsession with kids and their veggie intake in a later post...) I don't freak out when my kids turn down vegetables at one or two or even twenty-two meals. I have studied what is normal developmentally for children of different ages and know that it takes time and practice to learn to eat well. Thankfully, one meal or one week of meals or even one month of meals isn't the be-all end-all. Our goal should be to aim for a variety of foods and a rainbow of colors over a period of time. Not every plate will be perfectly balanced and that's OK. If food fights are commonplace in your home right now and you wouldn't exactly describe your child's diet as "healthy," take heart. You certainly aren't alone! You would be amazed at how many battles are instantaneously defused when a child realizes you aren't going to force them to eat. Feeling overwhelmed and confused? That's okay. We are just scratching the surface. In the days and weeks ahead, I hope to dive into these concept even deeper, providing you with specific feeding "jobs" as parents that will help you wrap your mind around how this all works. I also plan to flesh out what maintaining the Division of Responsibility looks like in practice with real kids and real situations, because we all know it's one thing to read something on paper and it's a whole different ball of wax to try and apply it to a specific scenario, right? All right, more soon. To subscribe to my posts, go to my homepage and enter you email address into the "Subscribe to my posts" box on the far right column. You will reach an email notification each time new content is available. My affiliate link is used in this post. You can read my disclosure policy here.